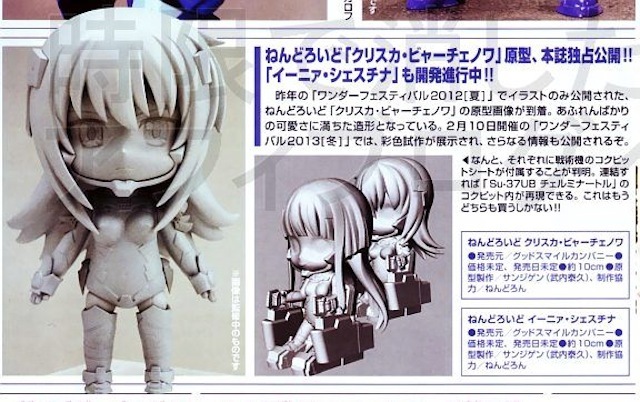 Well, it looks like another improved re-release is in the pipeline, as Nendoroid Miyafuji Yoshika: 1945 version made her first appearance in the latest hobby magazine scan. Every Nendoroid from Queen’s Blade series always has a 2P version, and Nendoroid Melona is no exception. Yep, the latest Hobby Japan magazine scan introduces Nendoroid Melona: 2P version, featuring light-blue theme of the swamp witch. So, what do you think about it, Nendonesian? 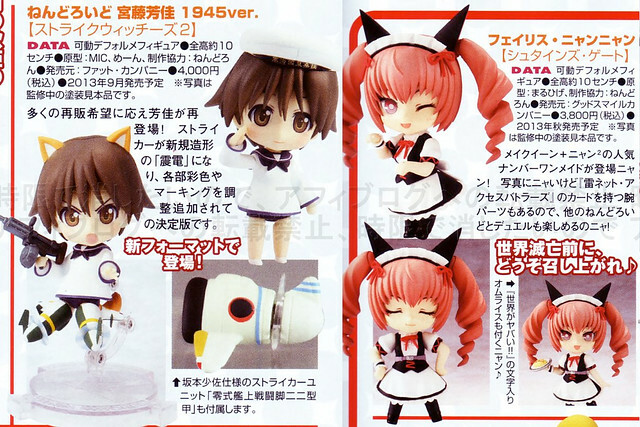 This month’s scan reveal a few more details to some upcoming Nendoroids and Petites that we saw back then on Winter WonFes 2013. 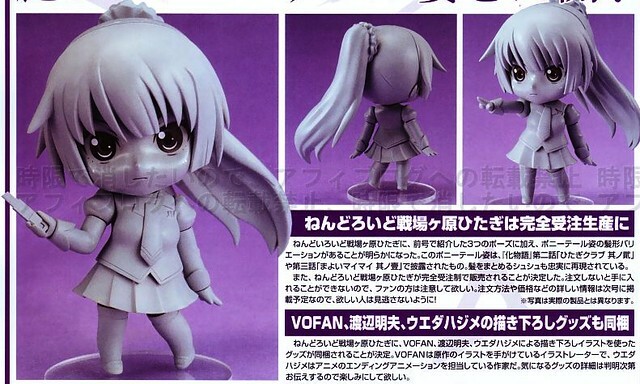 The anime series Muv-Luv Alternative: Total Eclipse will be getting more Nendoroid shortly as the prototypes of Nendoroid Cryska Barchenowa and Nendoroid Inia Sestina has been spotted in this magazine scan. See the right side of the pic? Yep, it seems that the cockpit parts will be included there. Awesome! What do you think about it, Nendonesian? 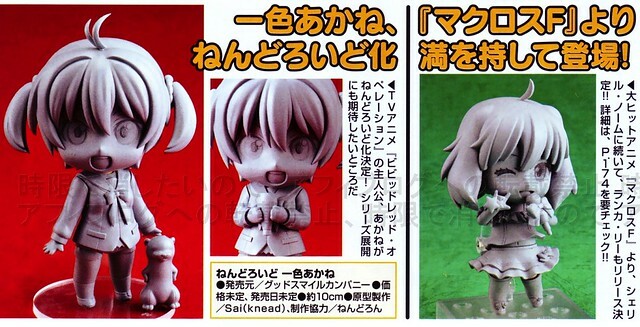 Nendoroid Melona from Queen’s Blade has been revealed in the magazine scan a few months ago, and now she re-appears in full-color, thanks to FREEing. Aside from the controversial outfit, Melona will also have an optional winking face and her slime-shaped feet as well. Anyway, she is going to be released on May 2013 with missing price tag at the moment. What do you think about her, Nendonesian? Are you Queen’s Blade fans going to get her? Nendoroid Melona from Queen’s Blade is revealed, and as usual she will be handled by FREEing. 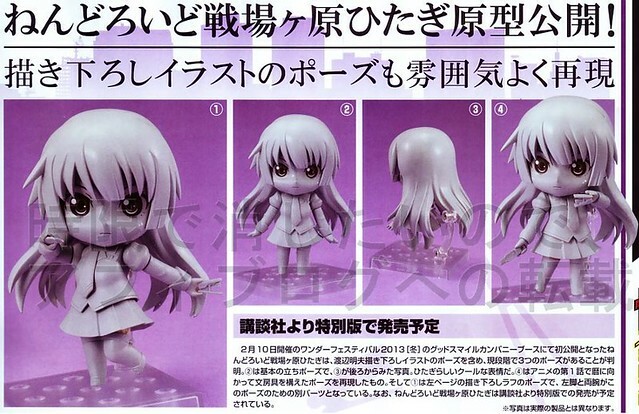 This Nendoroid will be released sometimes on 2013.